There are some businesses around the world which expand at a dizzying rate. 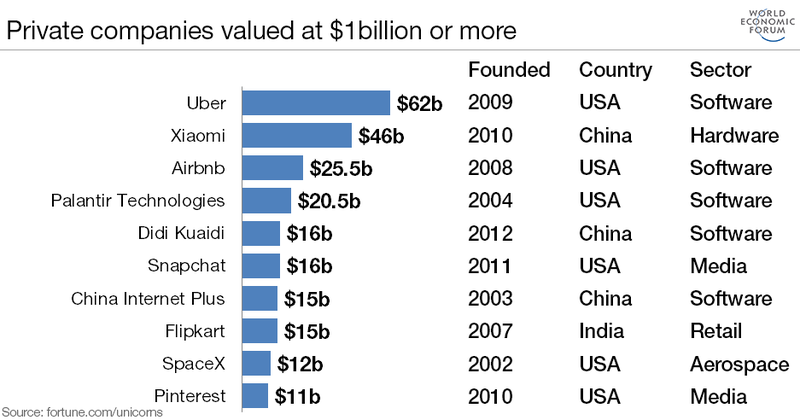 These companies have achieved "hypergrowth", doubling their revenues in less than two years. In the past few years, the number of companies that have mastered hypergrowth has increased. This is mainly due to the digital transformation of economies, more accessible (and cheaper) capital, and the emergence of new global markets such as the Asian middle class, according to a study from the World Economic Forum, ' Mastering Hypergrowth '. While companies from a range of sectors are experiencing hypergrowth, unsurprisingly, technology start-ups provide prominent examples of the trend. One example is Finnish mobile games developer Supercell , which recorded a $2.3bn revenue in 2015, just three years after launching its first product. If a start-up grows quickly enough, it might turn into that mythical and elusive creature: the unicorn, a private company valued at $1 billion or more. There are currently 174 companies on Fortune's Unicorn list , and below are the 10 highest-valued private companies. Read the full study, Mastering Hypergrowth .